PresenTense NTP Auditor creates a primary, secondary and tertiary audit log of local system time with respect to legal sources of UTC and automatically archives logs according year and month. PresenTense Auditor allows companies to comply with the time auditing requirements of NASD Rule 6950 - 6957 as specified by the National Association of Securities Dealers and the Securities and Exchange Commission ruling SEC Rule 71a-4 on records keeping. If PresenTense Time Server and PresenTense Time Clients are installed, complete time compliance can be maintained. The National Emergency Number Association (NENA) identifies time keeping requirements for Public Safety Answering Points (PSAP) such as 911 call centers. These requirements include continuous accuracy of 100 milliseconds to UTC. PresenTense NTP Auditor actively monitors your computer for conformance to the NENA standard. PresenTense NTP Auditor allows the display of National Emergency Number Association (NENA) compliant time. PresenTense NTP Auditor supports the generation of real-time logs to a dedicated line printer, creating an official record of system time at configurable intervals or in response to time changes between intervals. Paper logs are created in real-time to safeguard against data loss. PresenTense NTP Auditor actively monitors your time synchronization software and raises an alarm condition if your time server or time client is not operating. PresenTense NTP Auditor can notify you by email if the computer system time drifts beyond the limits specified in the NENA 911 standard, if your time synchronization software fails, or if audit trails cannot be created. 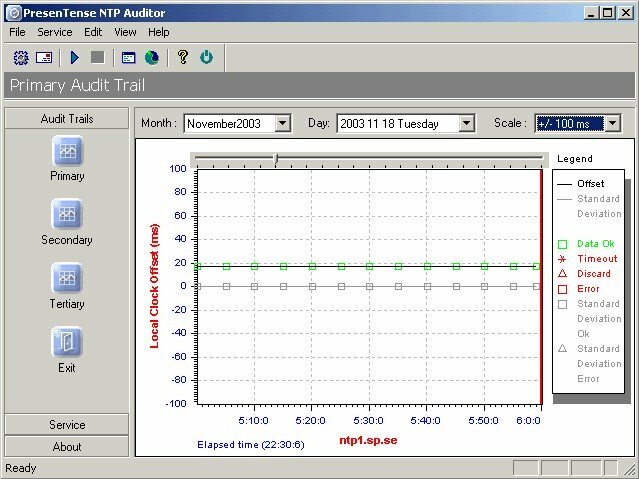 PresenTense NTP Auditor employs advanced statistical algorithms to evaluate clock measurements and mitigate the effects of network jitter and other statistical errors.